After my flight had been canceled several times due to the blizzards in NYC, I was fortunately stranded in sunny California with more time to seek out some great San Franciscan restaurants. I was searching for a dinner spot for 6 friends that had delicious fare in decent sized portions to satisfy some of the big eaters in my party. My friend Annie suggested checking out Beast and the Hare, a new restaurant that had opened only a month ago (November 2010) located in the Mission District. Now, the name intrigued me for two reasons. 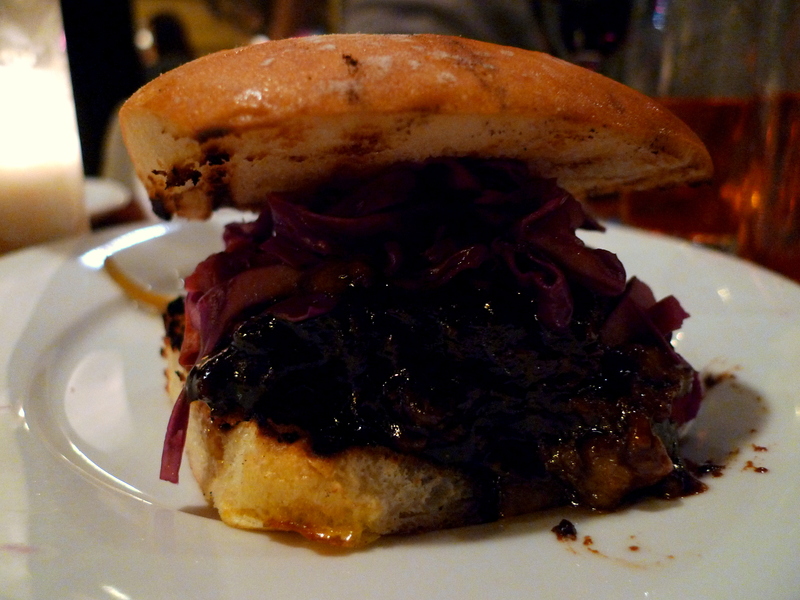 1) If the cuisine lived up to its namesake, I was in for a meatastic dining experience. 2) We had just dined at a restaurant called Beauty & Essex a couple weeks ago on its opening night in NYC (which was amazing). The fact that you could combine the names of these two brand spanking new restaurants on different coasts to come up with one of my favorite classic Disney movies of all time… well, it was a sign from the foodie gods. We had to go. If the restaurant had been named Salt Block as originally intended, it just wouldn’t have been the same. 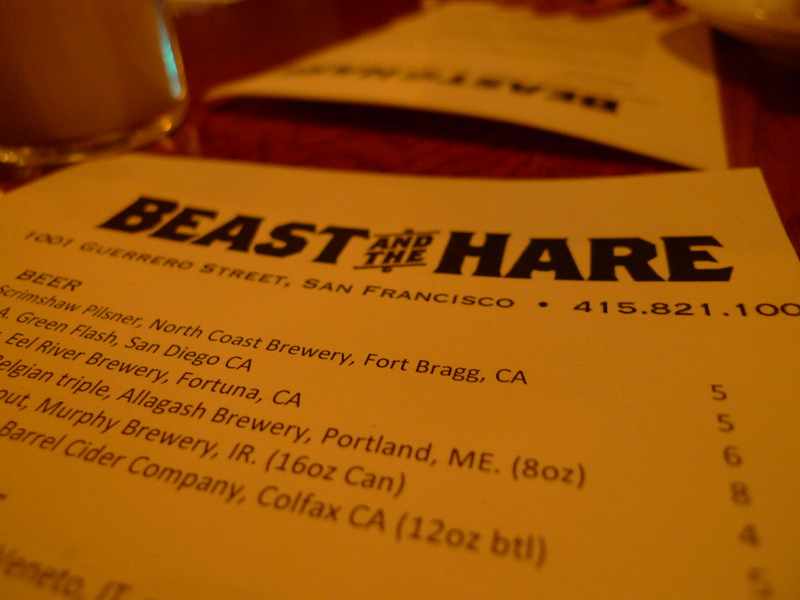 Beast and the Hare boasts the talents of Executive Chef Ian Marks, formerly of Hog Island Oysters and the Fatted Calf Charcuterie. Basically, that translates to succulent meats, freshly shucked oysters, more meat, savory fish (um in a bacon broth)… and then some more meat. 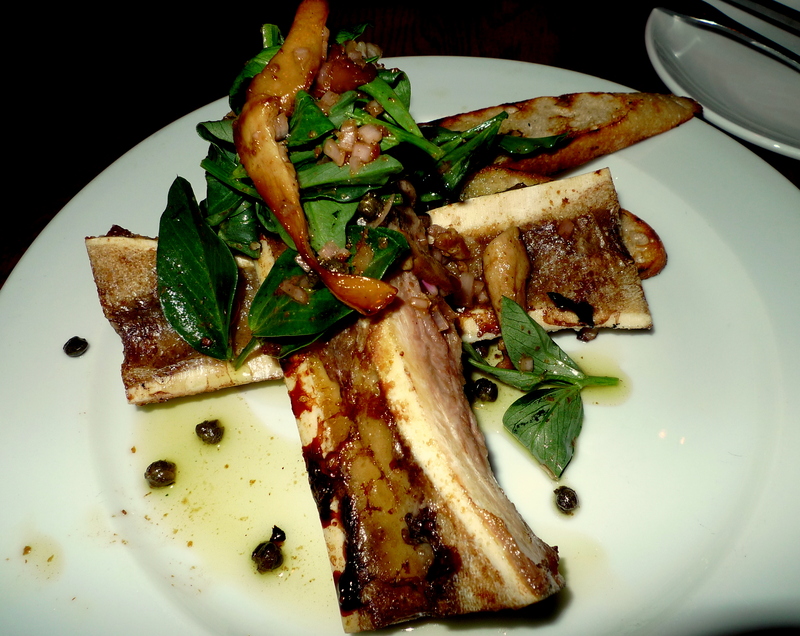 The restaurant is all about conquering the beast and the animal-driven menu is any non-vegetarians’ dream. For those New Yorkers, I would say this restaurant is a culinary cross between the Momofuku empire of the meat king David Chang and April Bloomfield’s rustic English gastropubs. But much smaller and cozier, and without the exorbitant Manhattan premiums. Plus, that chillaxed vibe that can only be found in the Mission. The restaurant currently does not take reservations, but you can enjoy a few oysters at the bar (carved out of a fallen cypress tree to make you really feel like you are in the wild) while you wait for a table to open up. 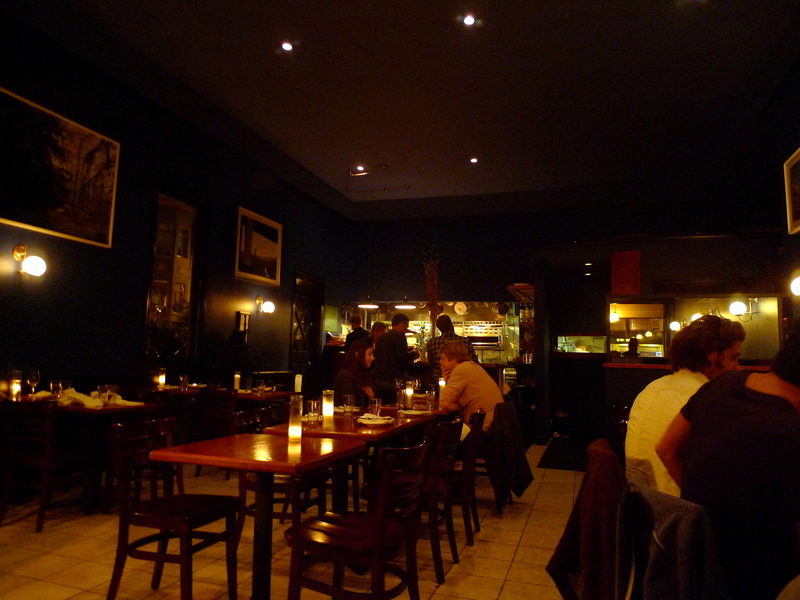 The interior is cozy and simple, with dark wooden tables and soft candelight illuminating the dark blue walls. The food is absolutely fantastic here and it seems the menu changes frequently to keep surprising the repeat clientele. I particularly loved the variety of meats offered; even though the menu is small, it seemed the entire animal kingdom was represented. As I said, this place is clearly not for vegetarians. Furthermore, it’s not for those crazy people who diet either. 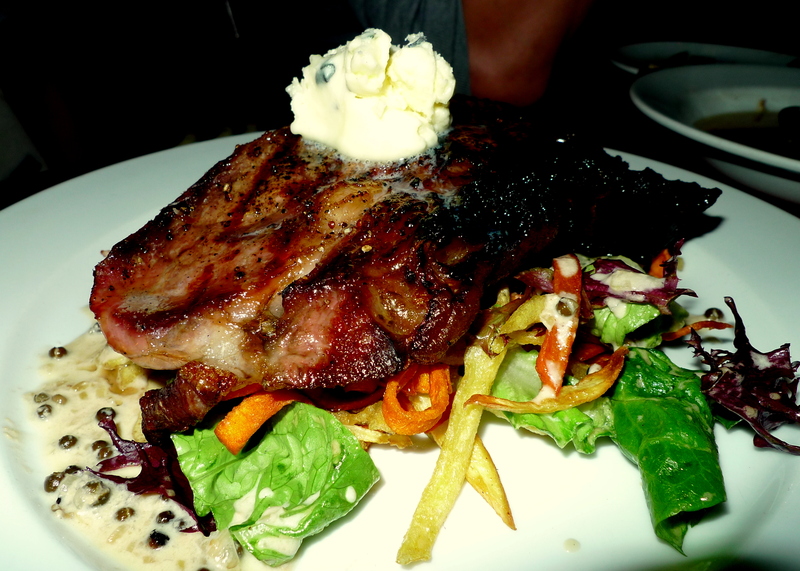 All these meats are the best of the best, and by that, I mean completely fatty and hence, delicious. This is not for the faint of heart, and really by that I mean faint of arteries. If you can actually feel your arteries getting clogged during your meal, it just means the you have entered meat heaven! The creamy pâté and crunchy house pickles were my absolute favorites on this platter. 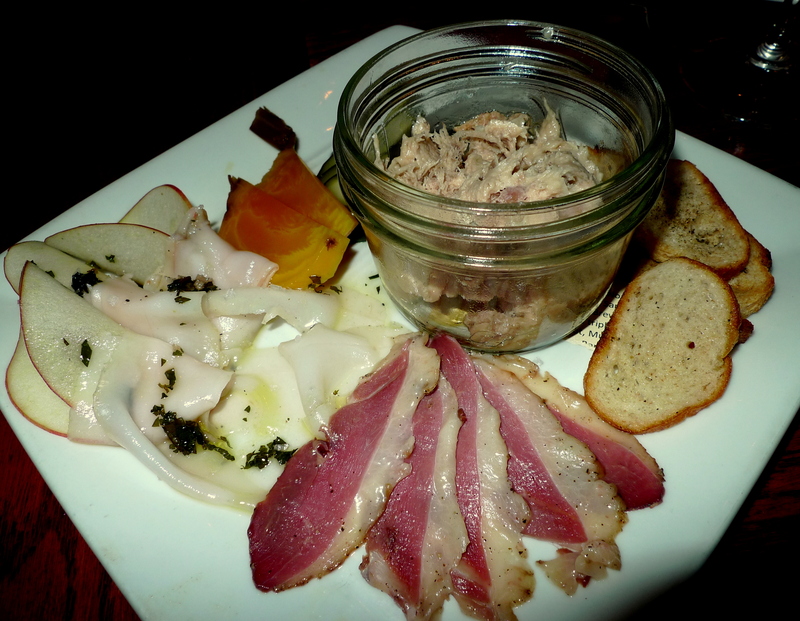 Considering Ian Marks’ experience at Fatted Calf, ordering his housemade charcuterie is a must! This BBQ pork belly is sweet and savory and fairly sticky… the sauce is almost like honey it is so ridiculously rich. I thought it may have been a bit too much even for me, but that still didn’t prevent me from devouring it. 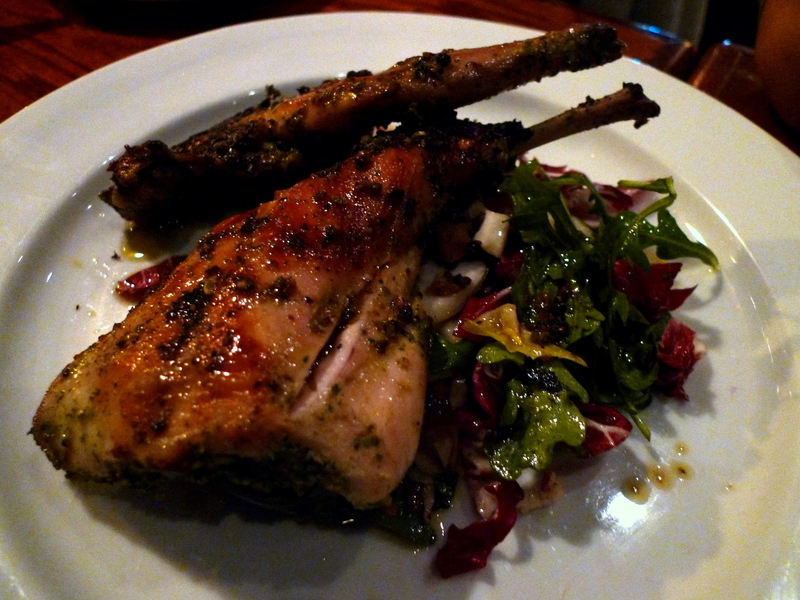 When you are at a place called the Beast and the Hare, you can’t not get the rabbit dish. I admit it was not my top dish here though (I think it’s because all the other dishes were just so unique and this was a fairly traditional preparation… perhaps the namesake put too much pressure on my palate) but it was still quite good: the skin was perfectly crisp and the meat juicy and tender. I loved loved this dish. 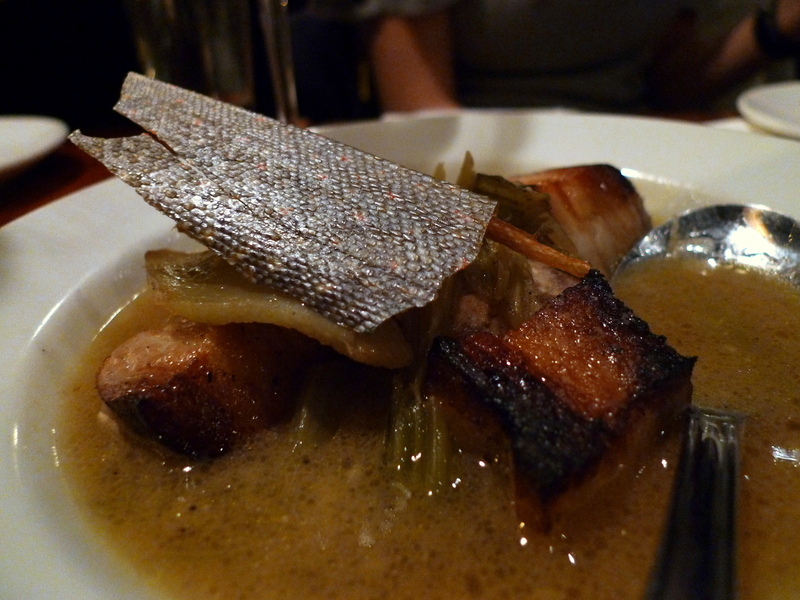 The fish was velvety smooth with infused smokey bacon flavors from the broth (haha yup no light seafood dishes here!) And I ate the baked fish skin like a cracker… it was fabulous. Bring on the meat sweats! Thank goodness had some healthy veggies to lighten the load… oh wait they are cooked like shoestring fries? Friggin’s ingenious. Bring it.